Jehoshaphat (873-848 BC) was the fourth king of the southern kingdom of Judah during the Divided Kingdom period. His war with the combined forces of the Ammonites, Moabites and Edomites is described in 2 Chronicles 20. It was reported to the king that a great multitude was encamped at En-gedi (v.2), located on the western shore of the Dead Sea. This good king prayed to God for deliverance (vv.4-13). God answered by a prophet named Jahaziel: “You will not need to fight in this battle. Stand firm, hold your position, and see the salvation of the LORD on your behalf, O Judah and Jerusalem. Do not be afraid and do not be dismayed. Tomorrow go out against them, and the LORD will be with you” (v.17, ESV). Encouraged by this word, the text narrates what happened next: “And they rose early in the morning and went out into the wilderness of Tekoa. And when they went out, Jehoshaphat stood and said, ‘Hear me, Judah and inhabitants of Jerusalem! Believe in the LORD your God, and you will be established; believe his prophets, and you will succeed'” (v.20). And when they [Jehoshaphat and the people of Judah] began to sing and praise, the LORD set an ambush against the men of Ammon, Moab, and Mount Seir, who had come against Judah, so that they were routed. For the men of Ammon and Moab rose against the inhabitants of Mount Seir, devoting them to destruction, and when they had made an end of the inhabitants of Seir, they all helped to destroy one another (vv.22-23). All that remained was for Israel to gather the spoil: “When Jehoshaphat and his people came to take their spoil, they found among them, in great numbers, goods, clothing, and precious things, which they took for themselves until they could carry no more. They were three days in taking the spoil, it was so much” (v.25). 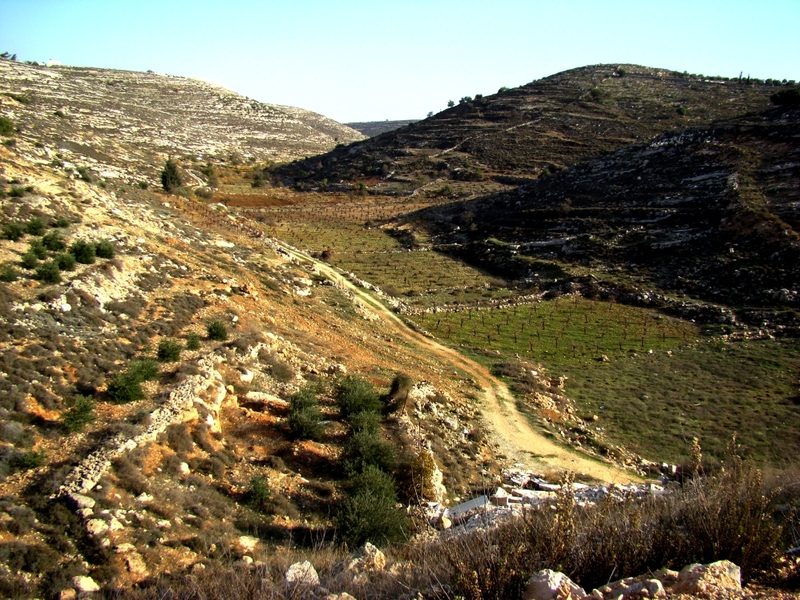 The site where this occurred is known as the Valley of Beracah (meaning: Valley of Blessing). Valley of Beracah, near Tekoa. Facing east toward the Dead Sea, and Edom & Moab. Photo ©Leon Mauldin. The text reads, “On the fourth day they assembled in the Valley of Beracah, for there they blessed the LORD. Therefore the name of that place has been called the Valley of Beracah to this day” (v.26). Photos such as this are helpful in visualizing the setting of the historical events narrated in Scripture. Click on photo for larger view. Back in 2010 Ferrell Jenkins did a post on the Valley of Beracah. He and I visited this site in Dec. 2009. This entry was posted on Friday, March 24th, 2017 at 3:59 PM and is filed under Bible History and Geography, Bible Places, Bible Study, Israel, Old Testament, photography, Travel, Uncategorized. You can follow any responses to this entry through the RSS 2.0 feed. You can leave a response, or trackback from your own site.